Years ago before the Smoky Mountains became the moonshine capital of the world, only those who knew the secret of BOOTLEGGER HILL HIDEAWAY could find that mountain treat. Today, BOOTLEGGER HILL HIDEAWAY can be part of your vacation! This authentic log cabin is conveniently located in the Sky Harbor resort community between Pigeon Forge and Gatlinburg. 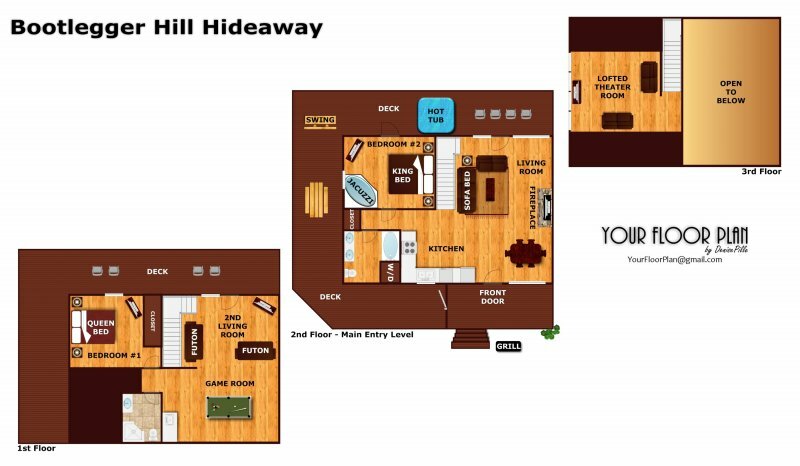 Three levels of mountain living include 2 bedrooms, 2 bathrooms, and 3 distinct living areas! Enter from the HUGE wrap around porches into a vaulted living room with stone/gas fireplace and LED TV. Upstairs a lofted movie room includes comfy chairs and 70" LED TV! Downstairs a game room with living area and pool table offer the ideal place to watch the big game. Bring a friend! The extra sleeping spaces provide room for up to 10 guests! This is one secret you don't have to keep. Sneak away this year to BOOTLEGGER HILL HIDEAWAY, and drink-up some mountain air! Absolutely enjoyed myself. Very nice getaway. Patriot getaways knocked it out of the park. I would highly recommend to anyone. From booking our stay until checkout, everything was exceptional. We can't wait to come back and stay in the Bootlegger Hill cabin! We loved it! This cabin was great! I have a family of 6, 2 adults and 4 children. There was more than enough room for everyone. The hot tub was large and was very relaxing. There were no issues at this property. We will definitely stay again!